Lubor On Tech: I Want You To Get Self-Driving Cars! I want you to get self-driving cars! All of you! Because, let’s face it, driving is no fun. Daily, most metropolitan areas are choked by terrible traffic jams. Today, as the traffic patterns force people either to buy houses or to find jobs in specific areas, traffic jams interfere with the health of our economy. I live in Waterloo which is just about an hour away from Toronto with its wealth of overpriced cultural and culinary experiences, but we rarely go because it can often take well over two hours of stop-and-go traffic to get there. The root cause of the problem is you. OK, us. Cars are reasonably small and fast and the roads are big, at least in America. In theory, they should be sufficient. In reality, though, it is the drivers causing trouble. There are countless reasons for traffic jams: accidents, rubbernecking from the opposite lane, unreasonable speeds (too low or too high), tailgating, haphazard lane changes, poor understanding of traffic laws (don’t get me started on roundabouts in Waterloo...sigh), and, yes, poor driving skills. All those issues have one thing in common - they are all caused by human errors. The solution is rather simple - eliminate the source of the human error - the humans. Of course such a proposition appeared like science fiction for years. The only self-driving vehicles were usually confined to highly controlled environments like airport terminal shuttles. Such vehicles use rails for steering, they don’t have to negotiate other vehicles, and they operate at a constant speed - hardly a technology that could replace cars. 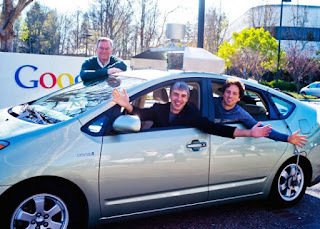 But then, Google came out with one of their pet projects - the self-driving car. At first, we didn’t believe it would even be possible. Sure, Google has some smart engineers and a pile of money to use for just about anything, but - self-driving cars on real roads? Give me a break! Yet Google didn’t relent and continued applying its magical algorithms to solve the problem of driving autonomous vehicles. Today, self-driving cars are already licensed to drive on the roads of several states, including California which has perhaps one of the worst traffic problems in the nation. The Google top executives in a self-driving car. I have to admit, I am still not entirely clear what self-driving cars have in common with what I consider Google’s core competence: search. Perhaps, it’s those smart algorithms that can negotiate traffic safely. And driving safely they apparently do - the self-driving cars have supposedly driven thousands and thousands of miles without any accidents. That’s amazing! A true testimony to the state of technology which is today capable of replacing humans at some of the most challenging, intellectual tasks. The beauty about the self-driving cars is that they don’t cause accidents, they don’t speed, tailgate, or rubberneck, and they know the rules of the road. That’s why they can drive without those humans causing errors that result in traffic jams. But a single self-driving car will not solve the issue. It might free me to do whatever I want while dealing with the traffic on its own but the frustrating traffic jams will only go away if all of the cars are self-driving. We won’t eliminate human errors by replacing one human driver, we have to replace them all (or at least most of them). That’s where I need you to get a self-driving car. All of you. Please get one as soon as possible. I don’t know where to buy one today but we all need them. Preferably, get one running on alternate fuel too to solve the pollution issue at the same time. Or just take the train. But until we replace the human drivers, we will have to deal with traffic jams and driving will remain a misery. You sound exactly like the people who were encouraging others to go from horses to the car. But I'll agree I think it's an improvement too. Thanks for your comment, Stacy. I agree that we are still years away from this technology to go mainstream but it will revolutionize the way we move around.